Go over current and predicted fees and tuition charges for CCSD San Marcos, as well as just how these costs contrast to regional and nationwide averages. Find out how tuition and fees at California College San Diego - San Marcos measure up to other universities and colleges and learn how to successfully prepare for probable tuition growth. 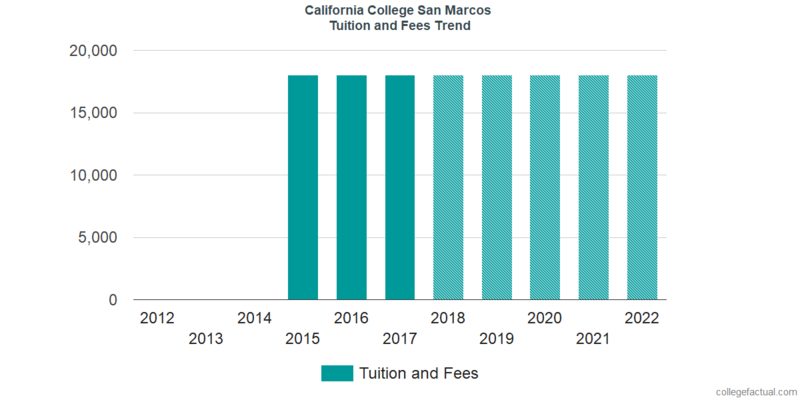 How do Fees & Tuition at CCSD San Marcos Measure Up To Other Colleges? For nationwide, regional and statewide comparisons, look at the following table to find out how CCSD San Marcos compares to other colleges. In the 2017 - 2018 academic year, full time students at CCSD San Marcos paid $18,021, before adjustments for financial need. Of this amount, the price tag on tuition totaled $18,021. California College San Diego - San Marcos tuition and fees is the number billed to students for one year of attendance, not including room and board. Yet, a lot of students will end up paying below maximum tuition because they receive financial aid and other reductions. How much does CCSD San Marcos cost part time? For more info, click CCSD San Marcos Part Time Tuition & Fees. Tuition and fees at California College San Diego have stayed stable for the past 5 years. We predict the price tag on tuition and fees for this year will be $18,021. If costs continue to remain stable, two years here will cost you $36,042 and four years will cost you $72,084. Furthermore, you may have extra expenses such as room and board, transportation, and books. The following chart shows estimated upcoming tuition and fees for undergraduates at CCSD San Marcos. Take note of just how much the tuition and fees are increasing yearly. At many colleges students will wind up paying a larger price for their last year of school than they did for their first.